It’s that time of year when people head to shopping malls in search of presents for everyone on their list. If you are searching for a history lover's perfect gift, look no further. 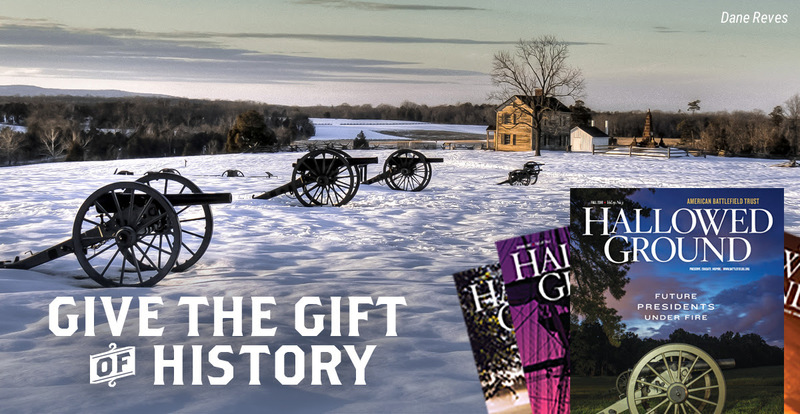 This season, give a gift membership and make them a part of the American Battlefield Trust. A gift membership is particularly meaningful at a time when people receive items they may only use for a few weeks or months. A gift of history and preservation lasts forever! Gifting a membership is a meaningful step in welcoming others to the cause. Your contribution will go towards saving hallowed ground and educating the public about why it matters. Your recipient will join the ranks of our dedicated members who work hard to protect precious acres of American history before they are lost to development. Giving the gift of membership online is simple, quick and doesn't require a trip to the store. Membership levels start at just $35, and your gift recipient will receive a personalized eCard from you. Plus, your contribution is tax-deductible. As a member of the Trust, your recipient will receive battlefield maps, an invitation to our Annual Conference and a subscription to Hallowed Ground, our quarterly, award-winning magazine. In addition, they will also receive a 10 percent discount to our new online store. If you gift a Sentry level or above membership ($50 or more), your recipient will receive a special Founding Member cap as an additional gift shipped to their address, free of charge. Whatever membership level you decide, you are making a difference by inviting someone to share your passion for preservation. Give a gift membership today so that future generations can appreciate and experience the story of America for many years to come. We've got an easy way for you to make a difference while you are shopping on Amazon — select the American Battlefield Trust as your preferred charity on Amazon Smile and a percentage of eligible purchases will benefit battlefield preservation. Over the years, we have received more than $15,000 in gifts from your support! A gift of stock could be an advantageous way of giving this year. With our Stocks & Securities donation model, you can save on taxes by making a gift of financial assets. Your broker can transfer stocks, bonds and securities directly to the American Battlefield Trust. Order the stunning, full-color American Battlefield Trust wall calendar for 2019. The calendar features beautiful photos highlighting some of the very landscapes that would have been lost to development if they were not preserved by the Trust and our partners. Plus, every purchase helps save additional hallowed ground. On December 8, the Graffiti House at Brandy Station will be open to the public. The Brandy Station Foundation will unveil the first stage of a new exhibit, "Culpeper's Forgotten Heroes: Black Union Soldiers of Culpeper County, Virginia." This permanent exhibit will be the first of its kind dedicated to Culpeper-born USCTs. If you are not in the Culpeper area, there are still plenty of activities for you and your family to partake in this holiday season. In honor of this joyous time, we recommend seven activities at battlefields and historic sites across the country. Find an event near you and experience how Americans and soldiers celebrated holidays long ago.